David Haye has offered to fight WBO and IBF heavyweight champion Wladimir Klitschko in Germany after prospects of the bout taking place in London faded. Haye's camp appeared close to agreeing a deal to host the fight in the capital in June, but it seems there are still issues to be resolved. "David will fight Wladimir anywhere they choose," Haye's trainer and manager Adam Booth said. 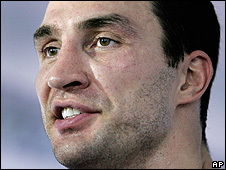 Klitschko, 32, who is based in Germany, boasts 52 wins in 55 bouts. His last success came on 13 December when the referee stopped American Hasim Rahman's punishment in the seventh round. Will the fight ever take place? Haye defeated American Monte Barrett last November and has 21 wins inside the limit in 22 fights, with one defeat. Booth added: "In regards to the rematches clause, I am baffled as to why Klitschko co-manager Bernd Bonte seems to have forgotten our last conversation about this. "We said they could have the two rematches they wanted, which effectively means David's next three fights could be in Germany against either Wladimir or Vitali Klitschko. "David doesn't want to dodge Wladimir and just pick and choose his way through boring, fringe contenders. "He wants to fight the best and restore some excitement to the heavyweight division. We only hope Wladimir feels the same way." Londoner Haye was previously expected to fight Wladimir's elder brother Vitali for the WBC belt. However, Vitali revealed that the siblings had tossed a coin to decide who should fight former undisputed cruiserweight champion Haye. Vitali, 37, who had announced his retirement in 2005 but reclaimed his WBC title last year, is now preparing for a mandatory defence against Juan Carlos Gomez of Cuba on 21 March.